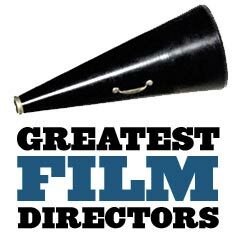 Greatest Film Directors of All-Time: These honored selections are designed as a tribute to some of the greatest directors of predominantly English-language films, with suggested or recommended Best Films or 'Must-See' Films from their filmographies. Unfortunately, some very talented directors have been pushed aside (50 is a limiting number), but it should be noted that many of these acclaimed film-makers were highly innovative mavericks and renegades who challenged the established 'system' that existed during their time. These choices are meant to encourage discussion and comparison, and to educate filmgoers about some of film history's most legendary and influential forces in film-making. The premise of honoring these film directors is based upon the debatable auteur theory -- the idea that the director is the primary 'author' or voice of a movie, and through a director's film, we see one person's way of viewing the world -- one that has the potential to change the way we see the world. This theory also holds that the how of a film (mise en scene, literally meaning 'putting in the scene') is something under the director's control. Elements or features of mise en scene include the action, composition, sets, props, lighting, costumes, make-up, cinematographic style and technique, and visual properties - and the theory postulates that these things are more important than the what or subject of the film. In any regard, the director is probably the most important person responsible for creating 'movie magic' and mixing together all the ingredients of the film-making process. What were some of the criteria used to select these Greatest Directors? See also this site's extensive write-up of information about the Best Director Academy Awards. (See the complete list of all Best Director winners here). And for fun, browse this site's information about Afred Hitchcock's Cameos, the Most Famous Film Director Cameos, and Notable Appearances of Directors in Films of Other Directors. A Ranking of the 100 Most Influential People in the History of the Movies from the Film 100 site is also worth a look. 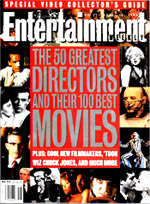 Note: Major criticism may be leveled at Entertainment Weekly's list - it included Jonathan Demme and Jerry Lewis, but left off Charlie Chaplin, William Wyler, Elia Kazan, Mike Nichols, and Michael Curtiz, to name a few. Note: There were some very glaring and obvious omissions from Empire's list below (i.e., Frank Capra, George Cukor, Michael Curtiz, Cecil B. DeMille, D. W. Griffith, John Huston, Elia Kazan, Buster Keaton, Ernst Lubitsch, Vincente Minnelli, F.W. Murnau, Roman Polanski, Powell and Pressburger, Otto Preminger, Douglas Sirk, George Stevens, Preston Sturges and William Wyler - to name a few), and their ranking was extremely questionable. Note: Included their picks for each director's "picture-perfect" film.